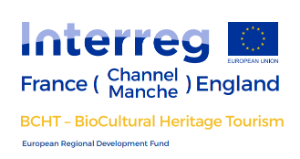 Four English and French UNESCO Biosphere Regions have come together, with substantial funding from the Interreg Channel region programme, to increase the economic value of tourism based on their natural and cultural resources, whilst reducing its environmental impact. In addition to The Living Coast in the Brighton & Lewes Downs area, the other biosphere reserves involved in the project are Iles et Mer d’Iroise, the Marais Audomarois and North Devon. All of these sites benefit from stunning landscapes and natural heritage and collectively attract more than 20 million visitors a year. It is this shared connection that has driven the collaboration on this project, with the assistance of the University of Exeter and Pas-de-Calais Tourism. The project concept of BioCultural Heritage Tourism (BCHT) aims equally to conserve the natural heritage sites, increase tourism-related earnings (not necessarily visitor numbers), and safeguard heritage and know-how stemming from cultural practices that connect people and nature. The project rationale is based upon using the Bio-Cultural Heritage of the four biospheres as pilot sites to develop a collective methodology and joint tools that are applicable to other protected areas in the Channel region. A tourism master planning tool will be developed, which is a strategic and technical tool that helps to plan tourism activities in an area together with supporting infrastructure. It seeks to induce behaviours that favour the resilience of natural heritage sites, through the organisation of space and of the activities offered to visitors. The reception of visitors will be more authentic and less invasive, and it will contribute to the conservation of the natural environment. A local network of eco-engaged partner companies will be established and supported to fully understand and apply the BCHT concept. They will benefit from cross-border exchanges of experience, training and tools in order to inspire new tourism services and products, creating a new customer base and a differentiation in the competitive tourism market. The four biospheres and the businesses will also trial the development of a new financial mechanism of voluntary contributions from visitors, for the benefit of future management and improvement of natural heritage sites. New pilot products and activities (both indoors and outdoors) supported by local public bodies will be identified and developed in line with the BCHT concept. The pilot actions will be assessed for replicability, positive impact and the increase in quality of the visitor experience, in order to become the foundation of a new shared offer between public and private bodies that is in keeping with biosphere values and tourism trends. They will support visitors in their bio-cultural heritage experience, from awareness-raising to active participation, and though local marketing campaigns based upon a shared cross-Channel approach. The project has a 3 year timescale until September 2021 and will receive €4.4 million overall from the European Regional Development Fund (ERDF). Brighton & Hove City Council as a project partner will have a local budget of €530,000 – for which €365,000 will come from the ERDF.